Accessories can be all that you need to provide that WOW factor you're looking. Here you can find beautiful hats and gloves to complement your lingerie, or even your outerwear outfit. Gloves & Hats There are 8 products. Playful lady’s black gloves. Fishnet gloves, finger sensual lace. With sensual patterns and floral inserts this black lace gloves are characterized by their attractive shape with exposed fingers and careful patterns all over the surface. Eye catching red mini top hat with with fine red mesh detail and floral work. Semi transparent ornament in the shape of a hat offering a retro elegant look. Decorated with adorable floral embellishment and feathers. Mini top hat with black feathers and fine mesh detailing, crystal stone and satin bow motif. 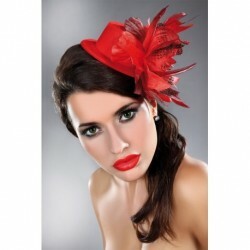 Elegant snow-white head fascinator with fine mesh in the shape of a flower and decorated with white feathers. A stunning bridal accessory. The elegant and highly feminine gloves will offer a perfect addition to any wedding dress.